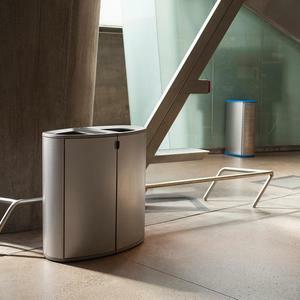 Drawing inspiration from airplanes and high-speed trains, our Axis Litter & Recycling Receptacle is a modular design that blends a streamlined stance, durable construction, and tremendous versatility. Axis is ideal for properties with both static and changing needs. 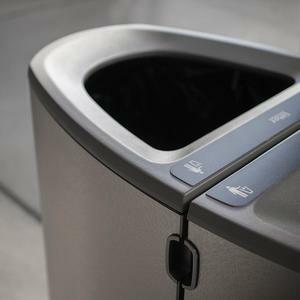 Individual receptacles can be used on their own for single-stream waste collection; two units can be connected for dual-stream use; and configurations can be switched on-site, thanks to hardware that makes it easy to attach separate units or detach joined units at any time. Regardless of configuration, Axis is a highly space-efficient design. Single receptacles fit snug against a wall, while double units placed in the open allow crowds to flow freely around. Axis body panels are stainless steel with a choice of three finishes: Sandstone, Diamond or Satin. An accent panel is available with four optional perforation patterns: Scape, Morse, Enigma, or Cipher. Hinged side-access doors on both sides of the body ensure easy servicing. Door handles of cast stainless steel have two latch options: a standard magnetic latch and a tool-operated security latch. Lid and base are solid cast aluminum with a range of F+S powdercoat color options available. 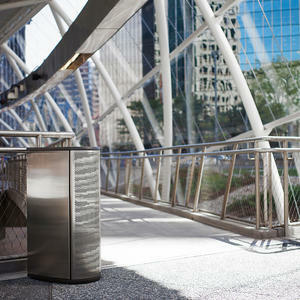 Designed to meet evolving waste collection needs, Axis is a smart choice for transit hubs and other high-traffic public spaces. 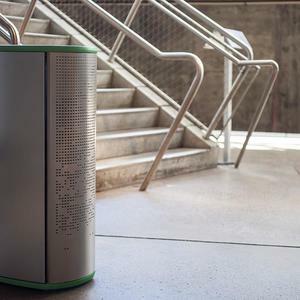 To learn more, visit the Axis Litter & Recycling Receptacle product page on our website, or contact us to find out how Axis can enhance your next project.